Charles Dickens is in the news currently as a lost original portrait has been discovered there is an appeal by the Charles Dickens Museum for funds please check out the link. Did you know that the great author had links to to our borough. The Guardian says: In 1847 Dickens had founded a “home for homeless women” with his friend the wealthy philanthropist Baroness Burdett-Coutts. With typical energy he found the premises – Urania Cottage in London’s Shepherd’s Bush – and then flung himself into organising every detail of it, from the food to the flower garden, and the piano around which the women would gather for wholesome evening entertainment. On a sadder note his son also Charles was born at Furnivals Inn in Holborn, London, the first child of Charles Dickens and his then-wife Catherine Hogarth. Charles Dickens Jr. Died 20 June 1896 (aged 59 ) Fulham, London, England. 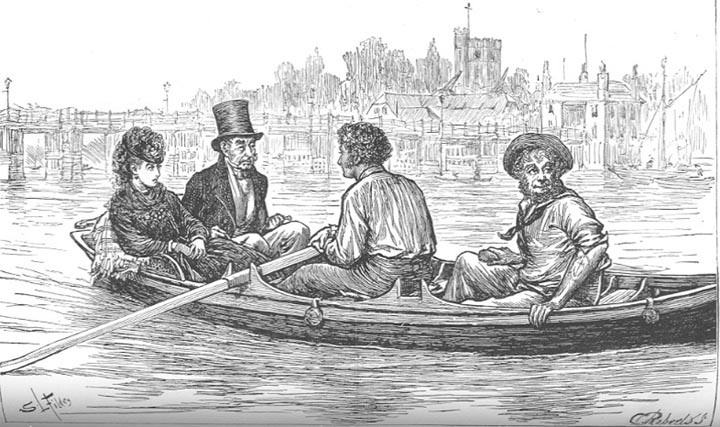 The area also features in his work – The mystery of Edwin Drood has a great illustration by Sir Luke Fildes of people in a boat passing by Fulham church and bridge. This entry was posted on Tuesday, April 2nd, 2019 at 11:54 am and is filed under Review. You can follow any responses to this entry through the RSS 2.0 feed. You can leave a response, or trackback from your own site.